The Gatling Gun Revival are a country-fuelled acoustic folk band created by singer-songwriter Corey Tam, and the beloved Poubelle International‘s Thomas Stroud. The fresh geniality that comes with their songs happens when an eclectic bunch of instruments and genres come together within bluegrass, folk, country and rock. The band have been influenced by the sounds of The Beatles and Simon & Garfunkel. ‘Snow Angel’ (Track 5) is more of a soft and humble track to put it bluntly, and is possibly my favourite to listen to on the album altogether. The unclothed appeal of this song works better with me in comparison with several of their other songs such as ‘Nothing Left to Lose‘ (Track 9) or ‘The Darkest Shades of Gray‘ (Track 1), which are in nature, more convoluted, jangly and energetic. In ‘The Darkest Shades of Gray’, the overall mood feels like seeing overly happy cowboys in the Western era, similar to Bob Dylan’s Duquesne Whistle. ‘Nothing Left to Lose’ is on the fine line of being a jaunty hoedowned track with loose-limbed blues, however, it luckily does not cross that line at all! It’s a delight to listen to, with lighter, fast strumming sentences and melodious vocals. Solomon’s War (Track 2)is similar in terms of its base, but it is generally more rueful, with a traveler’s melancholy to it. ‘At the Edge of the World‘ (Track 6) feature intuitive harmonies and articulate songwriting, while ‘Byzantine Hearts’ (Track 7) is intense piece with muffled vocals and an unstoppable momentum, featuring a guitar solo. 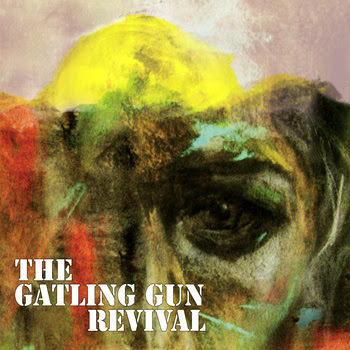 Thanks to their folk revival quality, The Gatling Gun Revival enrich their music with understated melodies and arrangements, lending them a timeless quality that transcends genre and generation.